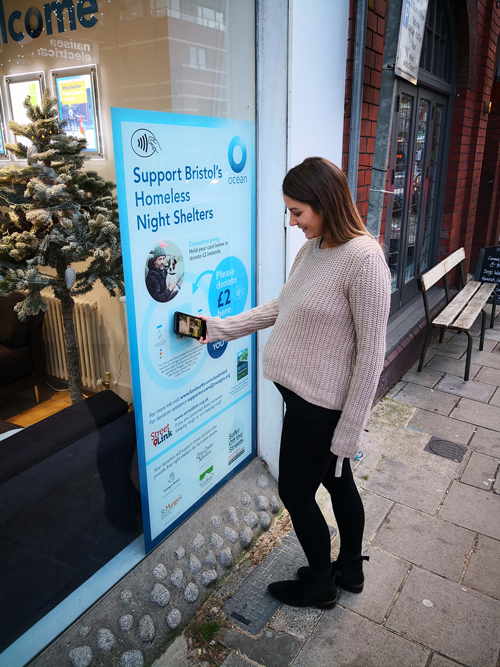 Ocean Estate Agents on Gloucester Road is to be the home to the fourth contactless donation station in Bristol; with proceeds going direct to the city’s four emergency night shelters. It’s two years since charity partners St Mungo’s, Caring in Bristol, Crisis Centre Ministries and The Julian Trust in partnership with Bristol City Council launched the first contactless donation station in Broadmead as part of the Safer Off The Streets campaign. The pioneering idea enables shoppers to make a contactless donation of £2 direct to the #SOSBristol fundraising campaign using their bank card. The Broadmead Business Improvement District (BID) supported the SOS team by donating the use of the units. To date the campaign has raised £68,681. After the first launch, Gloucester Road BID (GRBID) contacted the SOS team to develop plans to introduce donation stations on the Gloucester Road and has fully sponsored this recent donation point with Ocean offering their business as the location. Anne-Louise Perez GRBID Manager said: “Bristol's Independent District (managed by GRBID) is the voice of the local trading community. Sadly, we have seen an increase in people who are rough sleeping in the area. We are pleased to fully support an SOS contactless donation station, a facility which leaves in no doubt where people’s generosity is going to - providing warm shelter to the most vulnerable. With this in mind I am optimistic of a charitable response from all our local community." Brand Manager for Ocean, Andy Norris said: “We will have been on Gloucester Road as an Independent estate agent for 35 years in 2019, we are very fortunate to help people buy and rent homes all over the city from our 10 High Street offices. We are also acutely aware of the issues facing those who are far less fortunate and potentially sleeping rough on our city streets. There are four night shelters in the city offering 65 emergency bed spaces. Each shelter provides somewhere safe and supportive to stay while volunteers and staff work to help people find accommodation, and help with health and employment issues. There is also a new 24 hour shelter in St Anne’s which is funded separately by money from the Ministry of Housing, Communities, and Local Government (MHCLG). This accommodates a maximum of 30 people. Kat Lacy, Regional Fundraising Manager at St Mungo’s said: “From April 2017 – March 2018 St Mungo’s have worked with 770 people. We are delighted that the team at GRBID and Ocean have come on board as it enables us to reach more supporters in the city. It is simple to donate and will directly help people to be safer off the streets.